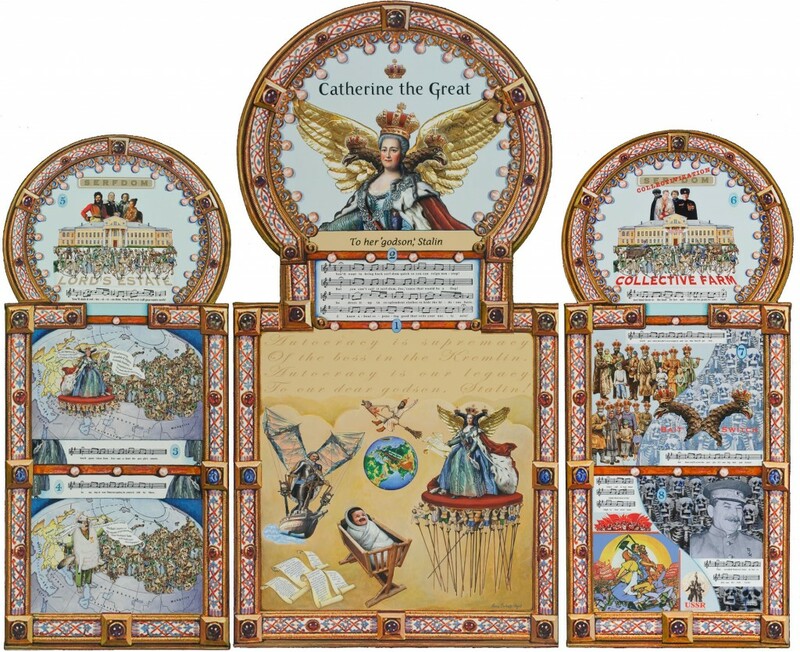 My PLAYGROUND OF THE AUTOCRATS triptych’s bag of tricks…. Anne Bobroff-Hajal gallery talk on "Dress It Up in Resplendent Clothes," June 2011. I don’t usually focus on my own artwork in this blog. But for the moment, I’m throwing modesty to the monsoons to celebrate completing my latest satirical triptych about Russian culture and history. My series of icon-like Russia triptychs is collectively called PLAYGROUND OF THE AUTOCRATS. In them, Peter and Catherine the Greats, Ivan the Terrible and Stalin host viewers on romps through the wild and wooly forces that have shaped Russian history over the centuries since the Mongol invasions to the present day. It’s a saga of Tsarism and Soviet Communism (more or less the same dictatorship by different names): the past as godparent to the present. Below is the character I invented for Catherine the Great. 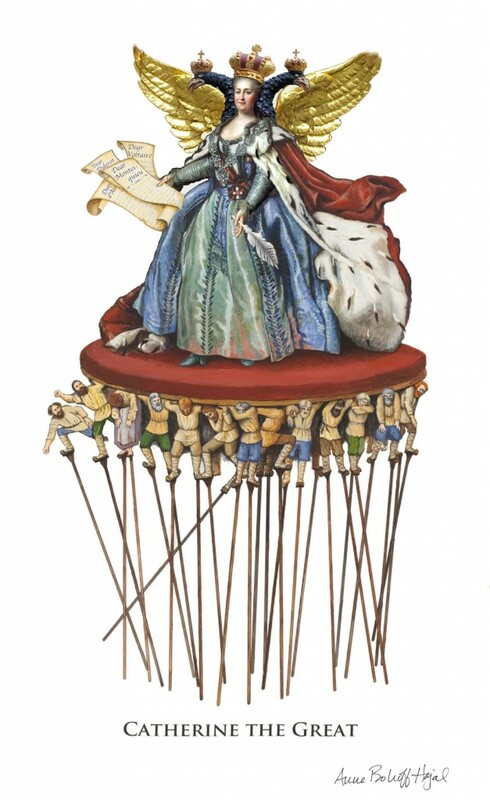 She’s the star of my newest, 7-foot wide visual/historical spectacle titled Dress It Up in Resplendent Clothes. What do I hope you’ll find in these insanely-elaborate artworks? My first goal with my triptych’s bag of tricks is to amuse and amaze you. But if you decide to keep gazing around the pageant I portray, I also want to horrify you, and make you cry, and show you some of the vast historical forces that sweep up hapless human beings in their powerful gales. So #1, bring you a smile. After all, Russia has fantastic history, a lush and glorious culture, enchanting and powerful characters. If you choose to go deeper, I hope to enrich your experience and understanding of the extremes of the human condition. Tragedy. Joy. War. Deception. Terror. You’ll find War and Tragedy in my first triptych, The Most Exposed Terrain on Earth. The second triptych, Home Security at Any Crazy Price, features Terror and Manipulation. In Dress It Up In Resplendent Clothes, Catherine brings Disguise and Deception. All in the spirit of fun, mind you! 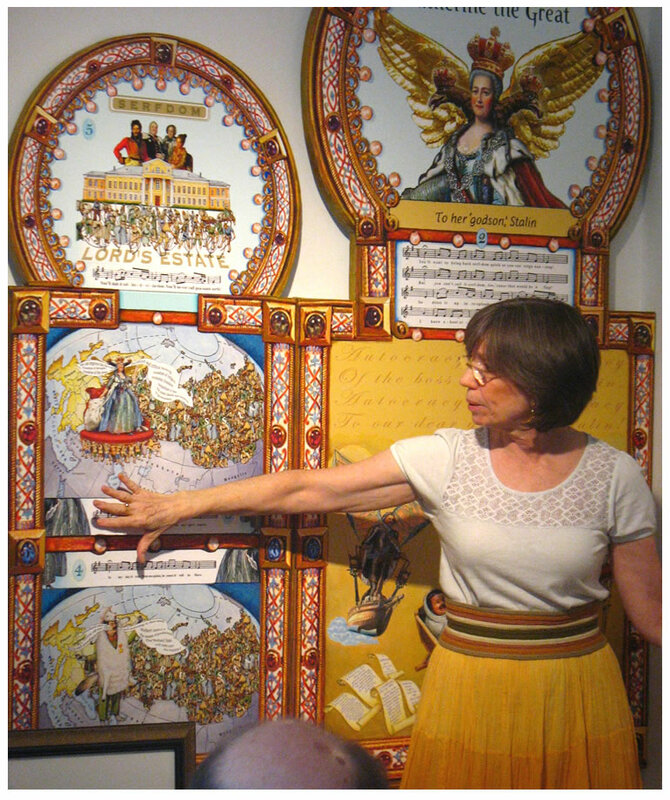 Anne Bobroff-Hajal gallery talk about "Dress It Up in Resplendent Clothes," June, 2011. She’s famous for having corresponded with the leading European thinkers of her time: Voltaire, Montesquieu, D’Alembert, Diderot (you’ll notice above that I’ve painted her holding letters she’s written to them with that feather pen in her other hand). Less often noted are some very unenlightened policies Catherine enacted. Every time she dumped a lover, she’d give him a new estate or two along with thousands of serfs to boost his wounded self-esteem. She extended serfdom in general. 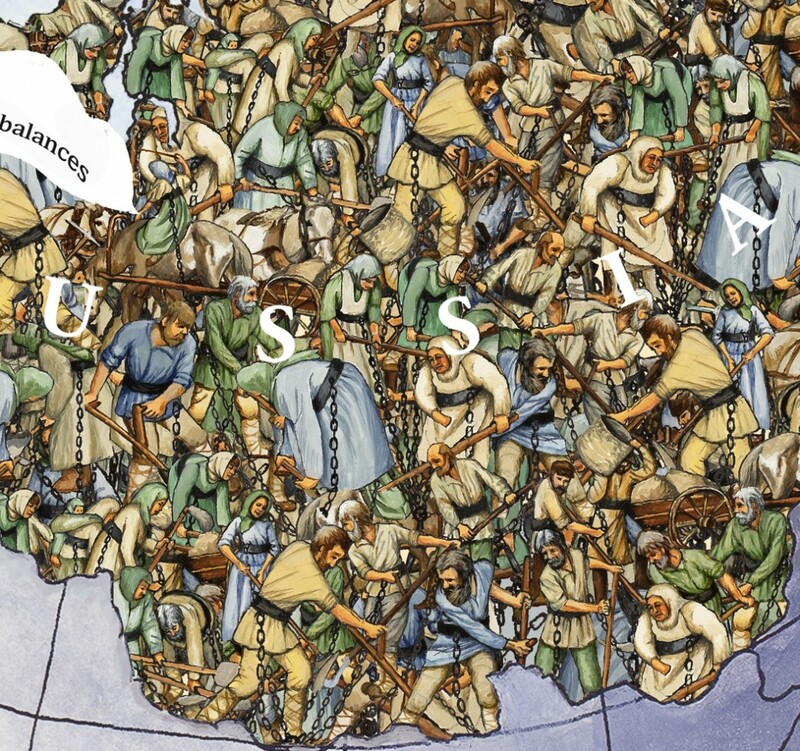 And she instituted the Jewish Pale of Settlement, which confined Russian Jews to living only in specified territories along the western border of her Empire. How do I paint Russian history? My triptychs use a technique common to icons, comic books, and animation story boards: they’re made up of a series of pictures that tell a story. 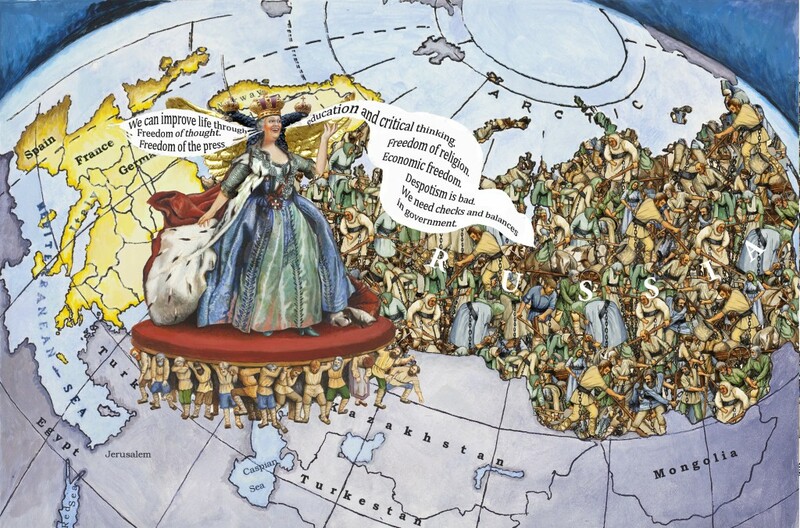 Below is one of the images I painted of Catherine the Great. It forms the upper half of the left panel of the triptych. 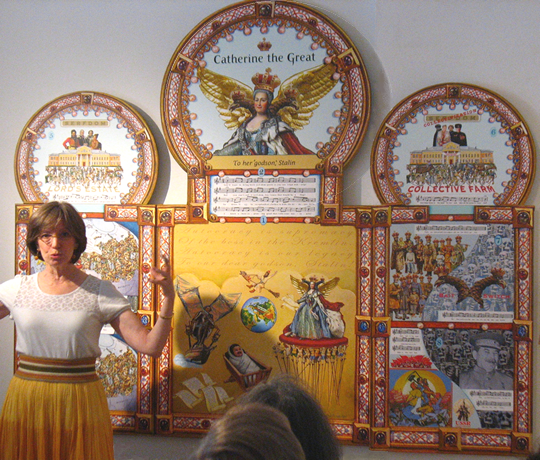 Below is a detail of Catherine’s captive audience, my depiction of her Russian serfs. There are many more scenes that make up the story I tell in Dress It Up in Resplendent Clothes, many more chapters to my tale. 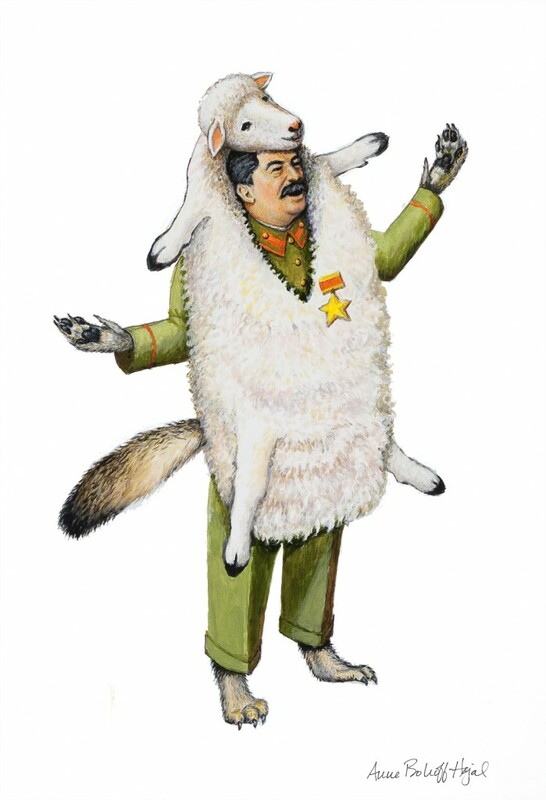 Stalin is involved, as the inheritor of the tsarist system and the history of serfdom. Oh, and the story is told in lyrics which I wrote to the well-known, beloved Russian folk tune KALINKA. The music and lyrics are all in the tryptich, too. You can see closeups of each panel here. How did I get myself into the years of research, planning, writing of lyrics, and painting it takes to create each PLAYGROUND triptych? I am an artist. But for about a decade of my life, I was under the impression that I was an academic historian, so I went to grad school to earn a Ph. D. in Russian history. The thrilling part was living for a year in the USSR, that great hall of crazy mirrors, doing dissertation research. My dissertation was later published as a scholarly book, Working Women in Russia Under the Hunger Tsars. But ultimately I became aware that I was seeing history in pictures that were more compelling to me than were academic debates. I set off on a long and twisted journey to find a path combining my two worlds, art and history. The result, finally, has been PLAYGROUND OF THE AUTOCRATS. Closeups of each “Dress It Up” panel in sequence are here; more on my process of creating it is here. This entry was posted on Tuesday, June 21st, 2011 at 1:48 pm	and is filed under About Anne, Drawing and painting, Featured, What is Playground of the Autocrats?. You can follow any responses to this entry through the RSS 2.0 feed. You can skip to the end and leave a response. Pinging is currently not allowed. Is it alright to place a portion of this in my webpage if perhaps I publish a reference to this site? Yes! Please include a clickable link to my page. And send me your link – I’d love to visit your website.